KENNYSWORK x INSTINCTOY reunited for this gorgeous new “The earth was bluish edition” Space Molly. 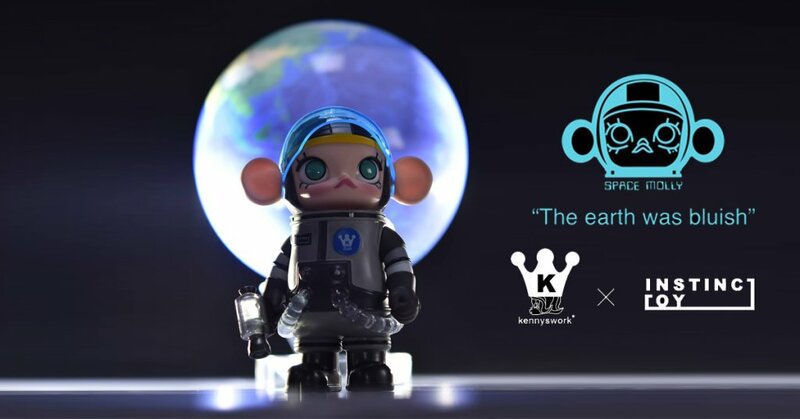 Ready to land at Tokyo Comic Con 2017 in December, Space Molly has been hard to get hold of without paying using a Kidney let alone this having a chance to own this KENNYSWORK x INSTINCTOY “The earth was bluish edition” but we will take our chances as INSTINCTOY released the details of hope. Here’s what 大久保博人 of INSTINCTOY had to say about the release. INSTINCTOY exclusive edition of SPACE MOLLY which is a very popular series from KENNYSWORK. This colourway is inspired by Kenny’s artwork 『twinkle twinkle little earth』2016, and I redesigned it to create an exclusive INSTINCTOY edition. The sales method at Tokyo Comic Con will be updated on Instinctoy blog and The Toy Chronicle obviously at the end of this month. The prototype of SPACE MOLLY The earth was bluish edition will be at to Dcon so if you’re lucky to be heading to Dcon you can check it out on display. It’s not all bad news for collectors whos not lucky enough to be at Tokyo Comic Con 2017 as INSTINCTOY has announced online sales will be made available after Tokyo Comic Con, stay tuned for further updates.